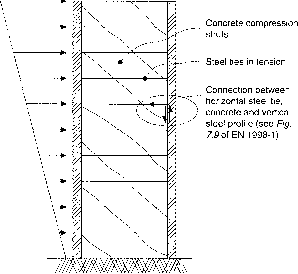 (2) the sharing of lateral forces between walls and frames depending on the rotation at the base of walls and columns due to compliance of the foundation (in systems with vertical elements of about the same size, such rotations do not appreciably affect the distribution of storey shears forces among the vertical elements). The sensitivity of the response to such uncertainties should be reduced through proper conceptual design and/or addressed through sensitivity analyses. If more than 50% of the base shear is resisted by primary seismic walls, the dual system is classified as wall-equivalent; otherwise it is defined as frame-equivalent. As noted on p. 90, the distinction between wall- and frame-equivalent dual systems has important practical consequences, as it determines whether the columns of the dual system should be capacity designed against plastic hinging above their base and whether design should account for the presence and the effects of masonry infills.